While I’m hesitant to say for certain that this video indeed shows what most people consider the Lady Moon Trail, I can assure you it shows images of an amazing hike up snowy hills on a gorgeous sunny day in a beautiful and deserted part of the Roosevelt National Forest in the vicinity of Elkhorn Creek and Lady Moon Lake. 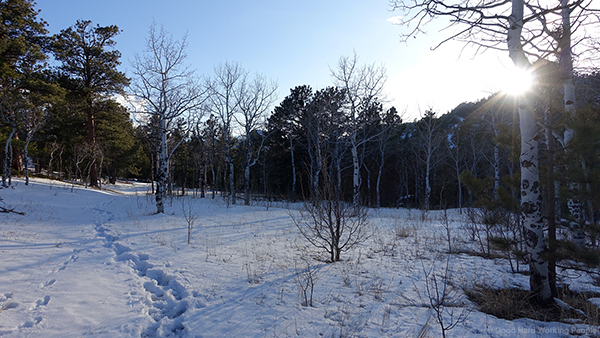 Even though we followed the sign for the Lady Moon Trail starting at the Elkhorn Creek parking lot just off Poudre Canyon Road (via Boy Scout Road), once we got deeper in, the trails themselves were covered in snow and there were no further trail signs. So we just followed someone’s snowshoe trails heading north and had ourselves a bit of an adventure in the vast and beautiful nature. Along the way, we climbed big piles of rocks to enjoy the view and have a picnic and took lots and lots of pictures and video. After the hike, I did some research and found out that the Lady Moon Trail is commonly described as a short trail heading south from the Mount Margaret Trailhead parking lot off Red Feather Lakes Road and then connecting to other trails and eventually leading to the trailhead in the south where we started. However, we never made it all the way to the north end of it… Instead we eventually hit a fence and then lingered on an impressive peak for a while just enjoying the view of the valleys nearby and the snowy peaks of the Rocky Mountains in the south and west. Now, I can’t wait for the snow to melt completely and the chance to hike this area again, maybe discover a “different Lady Moon Trail,” get a glimpse of Lady Moon Lake (private property) itself and explore the other connecting trails, especially the one to Molly Lake, where we spent a lovely day this past summer. The featured song is the instrumental version of “Insomnia” by Josh Woodward (JoshWoodward.com). This song is licensed under a Creative Commons Attribution 3.0 US License. Thank you, Josh!